Present your tastiest dish on this plate, then it's their turn give it to someone special. Love is like a tasty recipe: It's meant to be passed along. 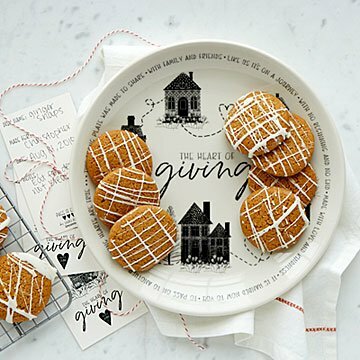 This charming plate lets you give both. Simply present that delicious recipe on the plate to someone special, along with one of the included cards—there's room for a note about what you made, or just a thoughtful message. Then it's their turn give the plate to someone special—we've provided five cards, because "like us," as the plate says, "it's on a journey." Ceramic plate made in East Liverpool, Ohio. Decorated in Edina, Minnesota. It was a gift. I didn't use it.